Intubation in the emergency department is common and can prevent a patient from dying from a reversible condition. While the benefits of such intubation for young and otherwise healthy patients are clear, it is less obvious whether the benefits of intubation outweigh the risks in older patients. 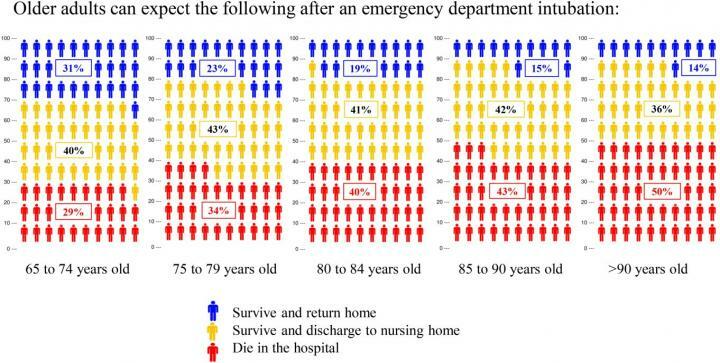 A new study by researchers at Brigham and Women's Hospital investigated the outcomes for patients aged 65 and older after emergency department intubation across a variety of conditions and disease. Their results are published in Journal of the American Geriatrics Society. "A surprisingly large number of older patients who underwent intubation in the emergency department either died in the hospital or were discharged to a nursing home," said lead author Kei Ouchi, MD, MPH, of the Department of Emergency Medicine at BWH. "On average, one-third of patients over 65 who received intubation in the emergency department died in the hospital." The retrospective study examined the outcomes of more than 41,000 adults aged 65 and older who were intubated in the emergency departments from 262 hospitals across the U.S. between 2008 and 2015. The study found that, overall, 33 percent of these patients died in the hospital after receiving intubation, 24 percent were discharged home, and 41 percent were discharged to a location other than home, such as a nursing home. The researchers found that in-hospital mortality following intubation was worse for patients over 90 than any other group, with 50 percent of those patients dying in the hospital following intubation, and 14 percent of these patients being discharged home. However, the outcomes were not drastically better for patients on the younger side of the study, with 29 percent patients between 65 and 74 dying in hospital following emergency intubation, and only 31 percent of these patients being discharged home. "It's important that older patients, their families and their care team are aware of this information and can use it to make informed, shared decisions about whether the patient should receive emergency intubation should such intubation be needed," said Ouchi. "It is difficult to make informed decisions on whether to provide intubation in older patients in an emergency situation because this is a very stressful and emotional time. Older patients, their families, and care providers are encouraged to make this decision before emergency situations requiring emergency department admission and intubation arise. There was no conflict of interest or sponsor for any of the authors of the study. Are children of married first cousins at increased risk of common mood disorders, psychoses?